It's summer in India and it's time to follow the best tips to beat the heat. When summer is severe, you feel completely drained off and your energy levels will go down. To keep yourself cool and healthy in summer, you need to eat healthy summer foods to combat the internal and external heat. Avoid drinking chilled carbonated beverages for temporary relief from heat. Instead take Indian traditional foods that give your long lasting cool effect. These foods help in maintaining the body vitality and helps you to stay healthy. There are certain age-old practices and traditional foods that keep the body cool and healthy in summer. 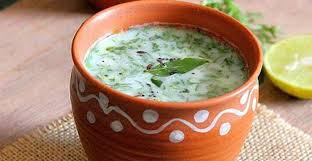 Curd and buttermilk are the best natural coolants that are extensively used in India since ancient times. Home made curd is preferable. A South Indian meal is incomplete without curd rice which is taken as the last item. You can either take plain curd rice. Home made flavored yogurt (curd) is much relished by children. Add sugar and ripe mango juice / banana / strawberry (if available) / peach and other such fruit to curd and blend for making flavored yogurt with no added preservatives. This is one of the best and most enjoyed cool food for children who get exhausted in summer vacation. Buttermilk is the best natural cool food / drink suitable for Indian summers. Take ordinary buttermilk or add spices to it for a tangy taste. An age old spicy buttermilk which is mostly taken in South India is adding a pinch of salt, a tsp lemon juice, finely chopped curry leaves, ginger and coriander leaves. Stir it well and refrigerate for a while. This is the best and tasty cool drink in summer. You can add other flavors like a pinch of jeera powder, chat masala etc as per your taste. Lassi - the most popular healthy cool drink mostly taken by North Indians. You can easily / readily make lassi at home and refrigerate it. 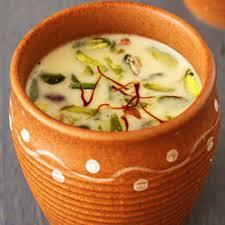 You can make sweet flavored lassi or salted lassi as per your taste. This is yet another best and tasty natural cool drink relished in summer. Cucumber is one of the best summer foods to quench thirst, gives a 'stomach-full' feeling and hydrate yourself. You can see local roadside vendors selling these and people enjoy munching it raw with added spices. Hmm! it's yummy and mouth-watering. But beware, avoid cucumber if you have gas-problem / indigestion problem / gastric problem. However, taking just a piece once in a while will not create gas-problem. Watermelon is yet another perfect summer fruit which is full of watery content. When you take a freshly cut piece of this seasonal fruit, it quenches your thirst, hydrates your body, give a filled-in feeling and above all make you cool. This fruit too, like cucumber, should be taken in lesser quantities by people who have gas-problem or chronic gastric problem. However, you know it better whether a particular fruit / vegetable suits you or not. You can make fresh juice of this fruit with sugar and refrigerate it before drinking which is much enjoyed. Lemon - the best panacea. Lemon is available in India through out the year and used in various recipes / salads etc. The best way to take lemon in summer is to make lemon sherbet i.e lemon juice. I am very much sure that every Indian knows how to prepare lemon sherbet at home be it sweet one or salted with added flavors. Lemon is a citrus fruit which is rich in Vitamin C. It helps in immunizing your body, energizes your body, keeps your cool and benefits you in many more way. Tender coconut water is best suited for Indian summers. You can find road side vendors with heaps of tender coconuts making brisk business in summer. Tender coconut water is the best medicine for combating dehydration which is prescribed by the doctors. 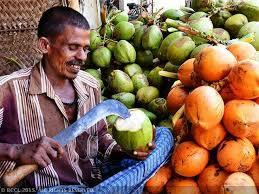 Its cost ranges from Rs.15/- to Rs.35/- depending on the size of the coconut and the city. Home-made sherbets or thandai which is taken extensively by Indians during festive occasions like Sri Rama Navami and Holi. These are healthy cool drinks that energize the body and keeps it cool in summer. In Andhra Pradesh, a special thandai called Ramarasam is offered as naivedyam to Lord Rama on Sri Rama Navami day in the Rama Temples across the state and is offered to all the devotees. In addition to the above mentioned cool foods, you can take other traditional foods like kulfi, home made herbal sherbets, cantaloupe i.e kharbooj, seedless grapes and even purple grapes. You can easily make grape juice at home and enjoy the taste. This also helps in giving you good sleep. Besides keeping yourself cool in summer with healthy and traditional summer foods, take care of your skin in summer.